When you last met your daring explorer (me, though daring isn’t that fitting) she was caught in a web of confusion (know as the baby shower). Today she had finally been released from the mental ward where … No. Wait. 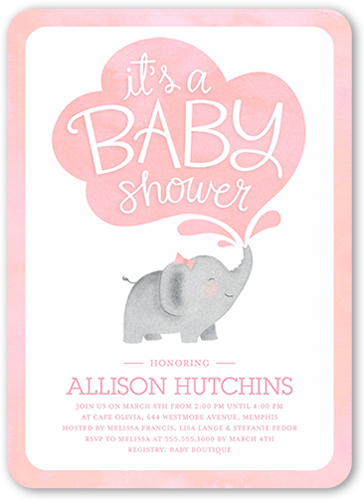 The baby shower was actually a success so there is that. This post isn’t really a follow up to that, but it was a fun experience and I would highly suggest you give it a go. Of course you need the whole pregnancy thing to make it work, or you can just throw one for the heck of it. But then that would be a little bit strange and people would probably shun you afterwards. You may not want to try that. Spring is here, and I am a new Aunt. Things couldn’t be better. I won’t share any photos, my family has seen them all on Facebook anyway and sharing them with the internet at large would be more than a little creepy. Not that I think “you” are creepy, but you have to admit that there are plenty of creepy people wondering the net. That is why I choose to keep my Facebook and Twitter accounts private. 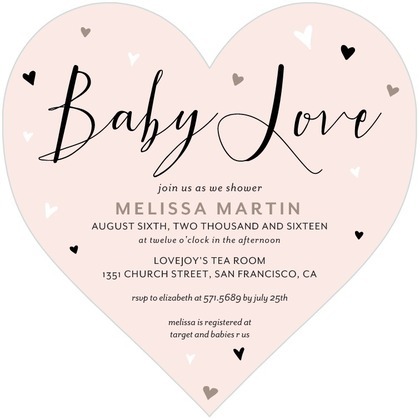 Anyway, when I made the baby shower post I felt a little overwhelmed and there was a good reason, but once I threw the last guest out (wait … saw them to the door), well it seemed manageable. And it was. But there was a lot of build up to it, and if you aren’t one to plan you might actually feel less stressed than I was. I tend to over plan, which makes things run smoothly, but also makes things stressful. Altogether it was a great experience and it was one that I am glad I had the honor to experience (that is more or less a “thank you”). I realized how neglected my site was in the last couple of months but I will be adding some new post soon. When you see the title of the site you will certainly read some egocentric meanings into it. But the true nature is much less sinister. This is my personal blog and I share things about my life. There are a number of aspects to it. Today we’re going to explore my new obligations. The first one is easier said than done, and the other is easier to done than said. Does that make any sense? 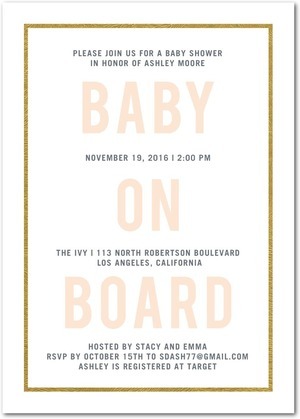 I will be attending a baby shower in a matter of weeks, six to be exact. That is the easy part. The difficult part is organizing it and preparing for the guests. 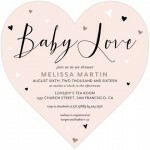 That is what you get when you get asked to host a baby shower and you say, “yes” I actually said “sure.” But the result was the same. Responsibility. I think that I can handle that part. 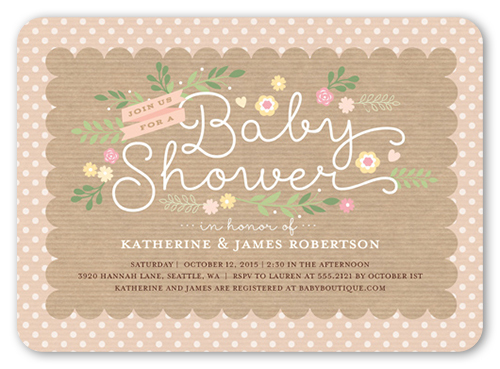 One of the aspects though that is driving me crazy about the baby shower though is the invitations and decoration. 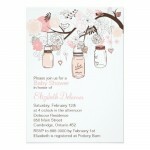 I love a great looking invitation as much as anyone, and there are so many to choose from. Conflicted is a good word to describe my situation. I know you’re not supposed to pick out something that you would like, but well, I have better tastes. 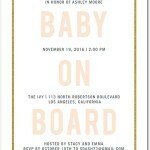 Here are a couple of baby shower invitations that I have picked out. 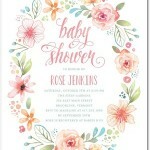 They fit with my tastes, and they fit in my budget, and I have a couple of great ideas for baby shower themes that would fit great with these invitations. That sounds all fine and good, I know, but I am conflicted because I am not sure that the styles would fit the mom to be. My sister and I have always had conflicting tastes, clashing is a better word for it, so if I pick something out that I like it will be a bust. 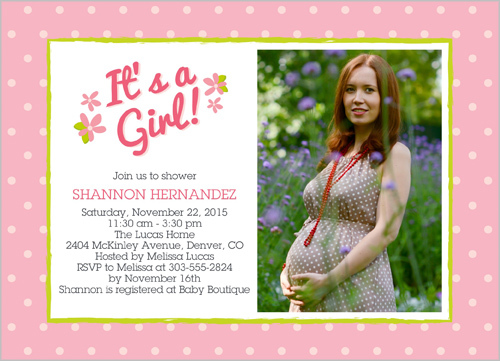 The invitations that she would like are boring. 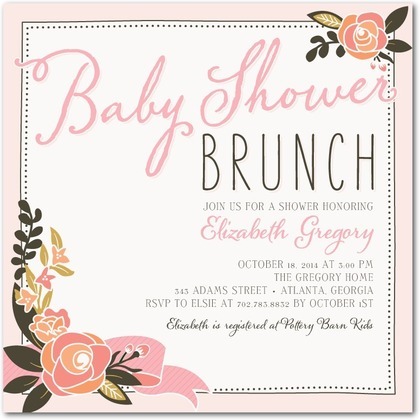 They go with boring baby showers. You don’t want that. 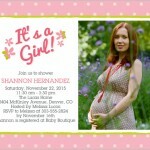 You want an incredible baby shower. One that sticks in people’s heads. And you need to plan it all the way through. 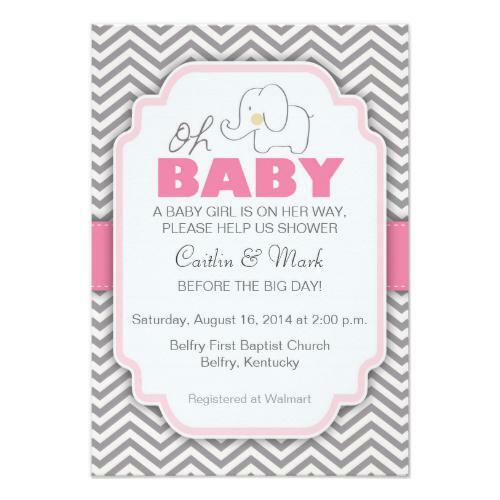 The baby shower invitations are just a part of that. But they are an important one. Besides I will be paying for them. If you knew us that last sentence wouldn’t sound nearly as dreadful as it does without the right context. 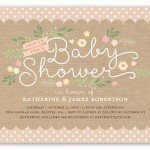 This is a set of baby shower invitations that I am thinking about. 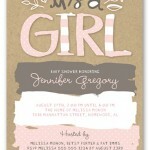 The pink cute aspect of the invitations is perfect since I will be the aunt to a beautiful niece. But then that is the next part. 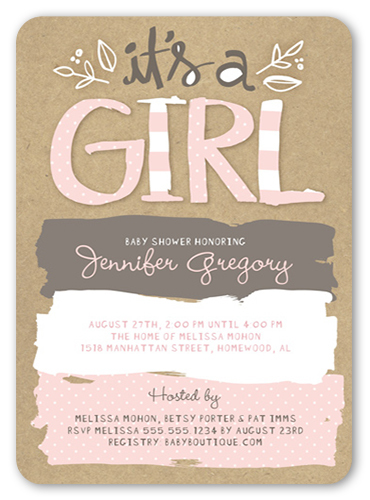 The right look is important, and I know that a gendered baby shower invitation is going in the right direction. That is why I am looking at these services for ideas. 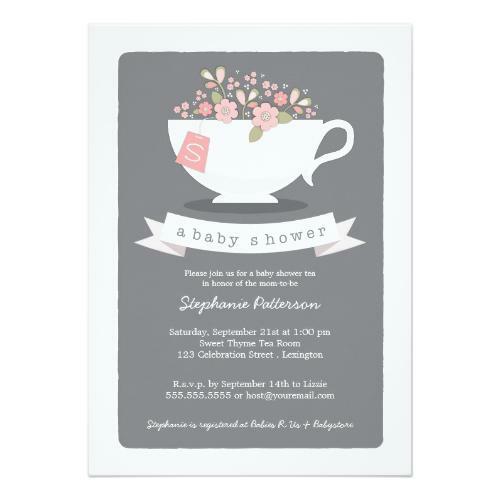 They have the invitations by color and gender. They have a number of different options as well as some cute options for girls that I liked. They are on the more expensive side, so I am not sure I will choose them. 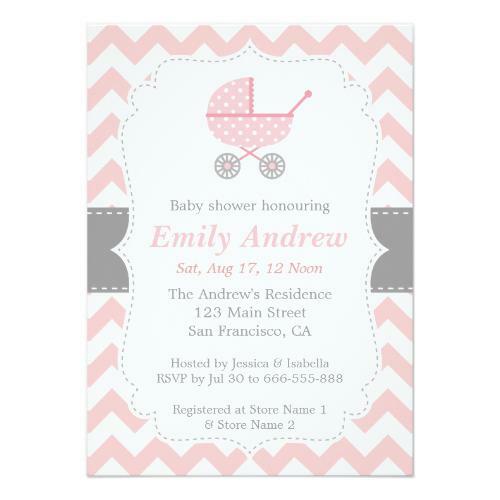 I received a note that the Tiny Prints brand and Shutterfly have merged. 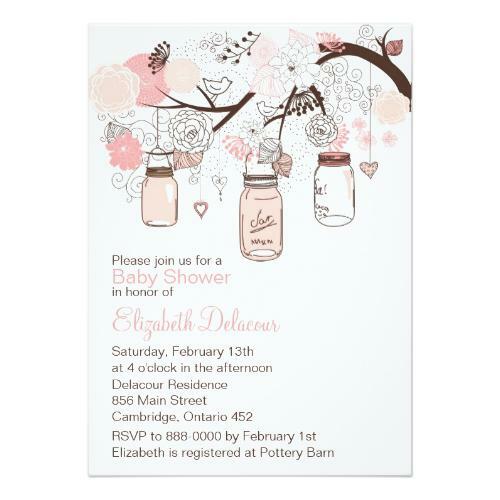 Which was a shock, but since they both offer different invitations I thought that I would leave Tiny Prints here as well. However, if they get removed from Shutterfly altogether I will remove them here as well. 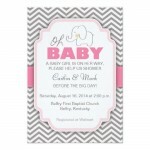 There are a lot of different options when it comes to pink baby shower invitations for girls which was interesting. One of the most interesting offers had a lot of different options to choose from. 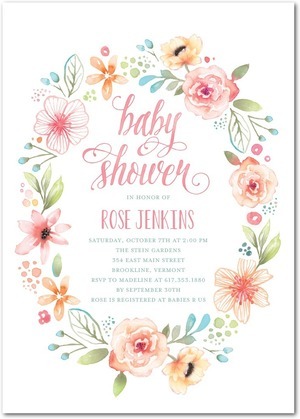 One thing that appealed to us was that they did more than offer the standard, pink and gold or gray designs that we had kept seeing on sites like Tiny Prints. 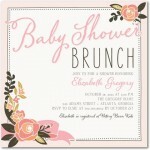 Instead they offered cute designs that were ideal for arranging a baby girl shower around a lot of different themes. This makes making plans easier. But it is refreshing to see some variety, and that that there are different styles to choose from. They also have a decent discount and low prices, which tilted the scale slightly in their favor. 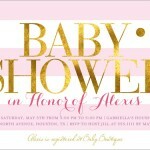 I know them for different services and I am not sure if I want to try them for invitations or not. I was actually surprised to see that they had baby shower invitations, but they also offer 50% off which is attractive. Somebody also suggested Minted which is a also a possibility I may look into. 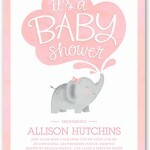 Here are some of the baby shower invitations I liked. Tiny Prints and Shutterfly are now the same site. 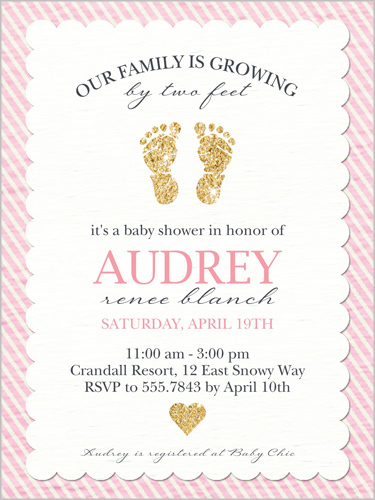 There will need to be a lot of time put into the baby shower, the planning is much more time consuming than I had anticipated. But I hope that it will be worth it. That will also be a job I will need to fill. 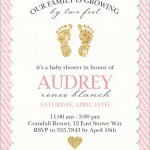 Once the baby shower is done, and everybody has forgotten about it I will be an aunt. And I will be that for the rest of my life. And I can’t imagine a bigger honor. When I am ready to have children my sister will be there for them just like I am going to be their for my niece. And I am a little nervous. I can’t imagine what my sister is thinking about becoming a mother but I know she will do a wonderful job. And if I can do just half as good it will be alright. We all need to learn. And I love a good challenge. 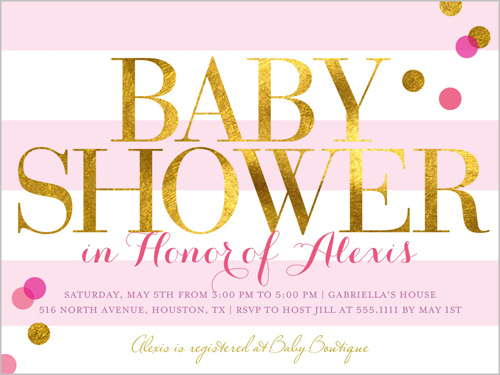 In the end the whole baby shower isn’t that important, it doesn’t make or break what will come after that, but I would just love to do it my way. And that is the main point here. When it comes my sister’s turn I know that, as the older sister, she will do it the way she sees fit. And I guess that is the important part. It was a battle between the dinosaurs, the popular Steven Spielberg franchise and the one that immortalized George Lucas. But in the end Star Wars: Force Awakens took the title of most successful movie of 2015. Beating out Jurassic World by $46.9 million. Still, The Force Awakens isn’t just the most successful movie at the world box offices it has also claimed a couple of other titles for itself as well. Box Office Mojo reported that it also reported that Star Wars is also the second highest grossing domestic release of 2015 with $544.5 million. World wide it took in place 15 on the all-time records. It is also claimed the largest second weekend ever. Whereas most movies drop by nearly 70% in the second week Star Wars stayed strong. But those are just a few of the highlights. This page contains all of the “ALL TIME RECORDS”, all 37 of them, for Star Wars: The Force Awakens. What does that mean for us? Not much right now, but the process behind the creation of Q-carbon is more inexpensive. The lead researcher behind the new method had spend a long time attempting to find an inexpensive carbon to diamond conversion. While it may have a limited use right now, Q-carbon has the potential to change the was synthetic diamonds are produced. As new applications are conceived the demand will further push the technology giving it a push to the next level. I cannot say that I have ever enjoyed a Nicholas Cage movie. Is that relevant? Maybe, maybe not. They just don’t appeal to me. Nor can I say I have followed the tabloid adventures of the A-lister that some have suggested is slipping towards a more consonant focused career. Still you can appreciate a good deed when you encounter one, and his recent act was maybe enough to give him another go. The title gives you a quick look at what I am talking about, but here is a little bit more insight into the event. Mongolia was robbed, one of it’s national treasures was stolen, the skull of Tyrannosaurus bataar. The Tyrannosaurus bataar is a relative of the Tyrannosaurus rex and only lived in Mongolia. The skull had been smuggled out of the country over the Gobi desert where it was purchased by Nicholas Cage in 2007. The actor paid a reported $276,000 for the fossil. When he learned about the origins of the skull he agreed to return it. This is only one incident of fossil smuggle that is an ever present challenge for researches since many find their way into private collections. What was interesting is that when I read this it made me realize several things. First, that the T-rex had family. And that there is an active market for fossilized dino bits. In closing it was nice to see somebody was willing to do the right thing, even if it cost them a quarter of a million dollars. If you think it is a good idea to leave the scene of an accident, think again. Not only are you in for a large amount of head ache when they do come to your door, it might not even be possible. That is what one Florida resident learned when he car called the authorities after it had been involved in a traffic accident. Police in the city of Port St. Lucie were altered to the accident when the Ford’s Emergency Assistance notified them to the accident. The safety feature activates when sensors on the car detect a sudden change of speed or movement. The call is automatically placed with emergency services and GPS data is then submitted giving response crews an exact location where the accident took place to further speed up rescue efforts. Depending on what the laws in Florida look like they may wish they would have hung around.